SUNDAY 2:44pm: By Jove, she got it. The hardest part was walking mom through how to make the keyboard pop up. No easy feat for a 99 year old but by golly she was determined. Now she’s busy listening to the book I put on Friday, The Heart of the Matter by Graham Greene. Narrated by a male British voice she said. So no FedEx. Yay mom. Yay me! I put a new Audible book on my mom’s iPad this morning and when she went to read it, her iPad went into the 11.0.2 iOS update frenzy. It updated okay, but as with every iPad update, it makes you start all over, choosing to skip/add Touch ID and Passcodes etc. It’s a total pain, even for me, the techie. But my mom, at 99, and with not the best eyes for reading small print on a screen, was NOT able to see how to skip through items, even though I did my best to walk her through it. I’ve looked high and lo for a real deal Apple How To video for bypassing all those choices but all I have found so far is the wanna-be techies, rambling on about nothing for 8 minutes. I need actual screen shots or a video that shows mom where the Skip This is located. She got frustrated, understandably, and turned off the iPad to go play bridge. If any of you can find this for me, winner winner chicken dinner. I feel I need to go down there and do this for her in person. She has friends who have iPads but I think she’s embarrassed to tell someone she needs help. Worse case scenario, she’ll have to get the senior community techie guy to come Monday. Time to go back to paper cups and string. Does this help? 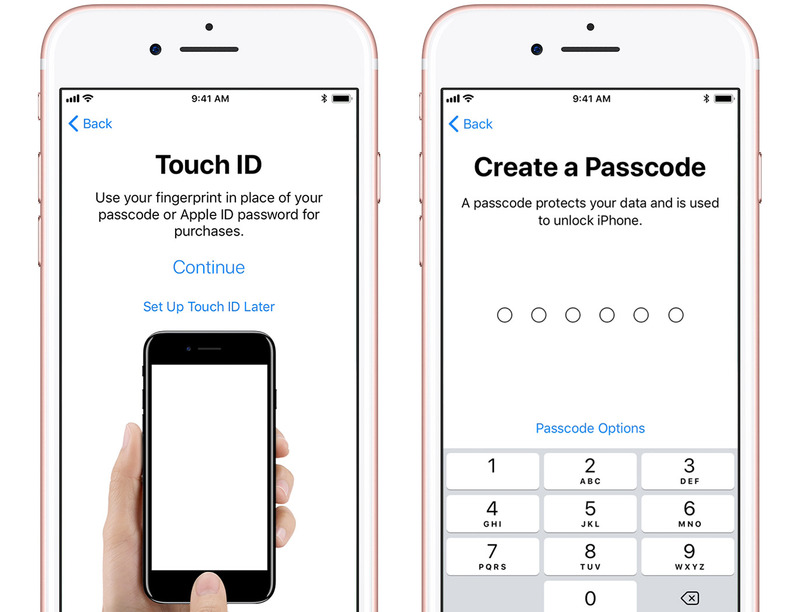 Your mom needs to tap “Set up Touch ID later” and Passcode Options where it will give her the option of saying No. Yes. That does help. Thanks. I like to put my devices in Aiplane Mode when I charge them so they won’t download the updates. I never update until I’m good and ready. Good thought. But my mom only uses her iPad for reading Audible books and needs it to be linked to her home wi-fi. It should download the updates only while charging even if she’s on home wifi. Therefore, if you turn it on Airplane Mode while charging, you can avoid the updates. Ok. That’s good to know. Mom’s learning curve is steep though. Why not just ship the damn iPad to you via usps or FedEx?😇?? Excellent thought. Because I would like to change her Settings, undo lots of the Defaults. I had hoped to make time for iPad lesson when I was there but we were so busy with other things. I emailed her the photos Jim attached and annotated each with what to do. She does better when she can take her time and go through it slowly. Never upgrade to a new software version until the release number ends in a dot-three. Mom’s iPad settings must be such that it defaults to Auto Upgrade without asking. She said when she turned it on the other day it started updating. She’s unable to get through the aftermath of updating so I took CosHarbour’s suggestion and asked mom to FedEx me the iPad tomorrow. That way I can log her in. Change some of the default settings. FedEx it back and ready for her to read. Funny you should suggest that. I thought about that too. There’s certainly the technology for it to happen, like when Dell techs invade ones computer by invite. It’s moot now. Thankfully. She uses the iPad for one thing and one thing only. Audible. She didn’t even know the iPad had a keyboard and honestly, knowing the limited use of the iPad by mom, it didn’t make sense to confuse her with mention of so many features. Thanks though.